Our Annual Banquet is held every spring. It will be held March 2, 2019. It is a catered event and entertainment is provided. 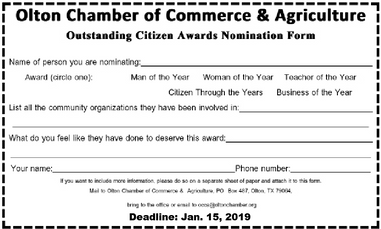 We honor a number of outstanding citizens: Man of the Year, Woman of the Year, Citizen through the Years, Teacher of the Year, Business of the Year and Farm Family of the Year. The outstanding citizens recognized at the 2018 Annual Banquet were: Man of the Year - Keeley Adams, Woman of the Year - Teresa Perez, Citizen through the Years - Mary Bass, Teacher of the Year - Cynthia Brooks and Farm Family of the Year - David & Rhonda Pinkerton. To read the official guidelines for choosing the winners or to see a list of all previous winners, click on the links below.